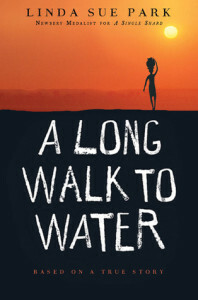 Goodreads Summary: A Long Walk to Water begins as two stories, told in alternating sections, about a girl in Sudan in 2008 and a boy in Sudan in 1985. The girl, Nya, is fetching water from a pond that is two hours’ walk from her home: she makes two trips to the pond every day. The boy, Salva, becomes one of the “lost boys” of Sudan, refugees who cover the African continent on foot as they search for their families and for a safe place to stay. Enduring every hardship from loneliness to attack by armed rebels to contact with killer lions and crocodiles, Salva is a survivor, and his story goes on to intersect with Nya’s in an astonishing and moving way. My Review and Teachers’ Tools for Navigation: The wars in Sudan and Darfur are the most violent and long lasting wars in the world; however, most Americans are unaware that they are even occurring. Linda Sue Park took a true story of a lost boy’s survival (watch a video about the true story here) after being chased from his village because of war and transformed it into a novel that will leave the reader with a feeling of awe. Awe of the bravery and pure fearlessness of Salva and the other Lost boys of Sudan and awe of the world of riches and blindness we live in while a horrendous war wages on the other side of the world. I love this book because it is very accessible to children, it won’t bog them down with too much history; however, it will definitely make them aware of the situation in Sudan. Discussion Questions: What is a way that you could share what you learned about the Lost Boys of Sudan? How can you help? We Flagged: “Salva took a few steps towards the men. A soldier approached Salva and raised his gun. Salva froze. All he could see was the gun’s huge barrel, black and gleaming, as it moved toward his face. The end of the barrel touched his chin. Salva felt his knees turn to water. He closed his eyes. If I die now, I will never see my family again. Somehow, this thought strengthened him enough to keep him from collapsing in terror. Going, the big plastic container held only air… There was little weight, going. There was only heat, the sun already baking the air, even though it was long before noon. It would take her half the morning if she didn’t stop on the way. Nya filled the container all the way to the top. Then she tied the gourd in back in place and took the padded cloth doughnut from her pocked. The doughnut went on her head first, followed by the heavy container of water, which she would hold in place with one hand. It’s a wonderful book. Several teachers at school have used it as a read aloud, Kellee, so good for important conversations! This is such a fascinating book. A great book to share with kids. I felt like I was transported into the book.